Vole O'Speed: Motion for the LCC AGM: "Uniformity of Cycling Provision"
Motion for the LCC AGM: "Uniformity of Cycling Provision"
LCC welcomes the Mayor's plans for the Cycle Superhighways, Quietways and the Central London Grid. However, it considers that the standard of all links in the overall planned cycle network for London must be uniform, in the sense that there must be equal suitability, usability, and level of safety, of all the facilities, for all cyclists who might use them. We consider it would be a mistake for the standards for any elements of the network, for example, the Superhighways or Quietways, to be specified in a way that makes them less suitable, for example, for use by children, or by inexperienced cyclists. The corollary of this is that network elements must not be such as to involve a trade-off between safety and convenience; in other words, cyclists wanting the safest journey should not be forced to use a less convenient or slower route, or a route having lower priority, because the most convenient, fastest, or most prioritised route is engineered to a lower safety standard. Note that the LCC ballot paper has printed the title slightly wrong. It should be "all ability groups", not "all-ability groups". This is a significant difference. The phrase "all-ability" is usually taken to mean something to do with disability. This motion does include that, but it is broader. It is about all who would like to use bike for transport. I'll try to explain in more detail why I think we need this motion on "Uniformity". We have a tradition in the UK of doing something different, and something odd, which has a history of failure. We have often tried to provide different tiers of cycling infrastructure, aimed at different “groups” of cyclists. This can take the form of parallel provision on the same road: you see things like a narrow, on-road advisory cycle lane on a busy road, typically blocked by parking, with shared pavement signage next to it, on a footpath that has been in no way adapted to make it sensible for cycle use, or to reduce potential conflicts with pedestrians. This is because planners believed that fast cyclists would want to be on the road, while for the others, a bit of paint on the pavement would do. A second form that parallel provision can take is the planners deciding that some cycle routes, engineered to certain standards, are the ones aimed at fast and confident adult cyclists, well-used to interacting with motor traffic, while other routes, typically, indirect ones, with many give-ways and obstructions and poor continuity, are the ones aimed at children and less-confident cyclists. All such attempts at parallel provision, for what are perceived as different “types” of cyclists, tend to fail, because they are a cop-out. They always involve a trade-off between safety, or pleasantness, and directness, or speed, which would not be made in a quality network. We get left with main roads which are still the only practical routes for most journeys, but have not been made any safer with merely a few splashings of paint, and low-grade shared-use facilities that attract few cyclists, and stoke conflict with, and resentment from, non-cyclists. 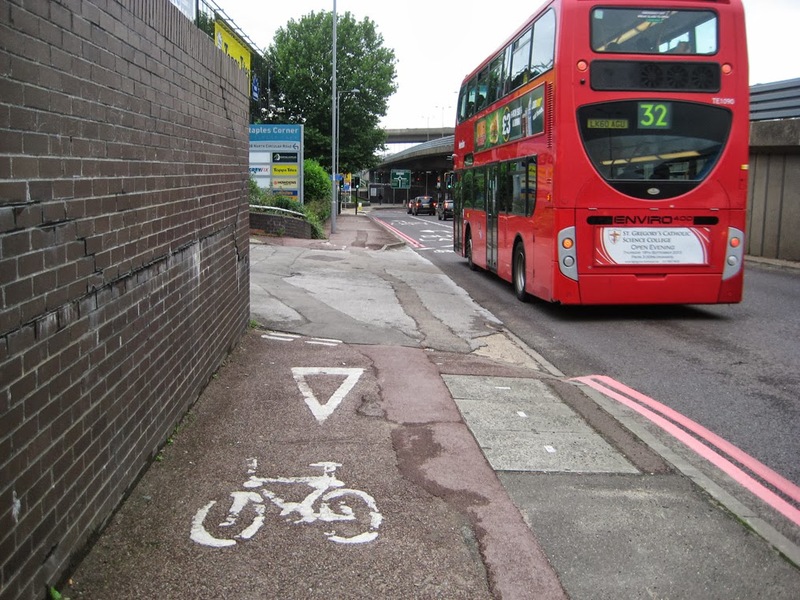 Terrible two-track provision for cyclists in Brent, at Staples Corner. As the photo above shows, though parallel, or two-track cycle provision sounds like it's going to be great, it's going to be cyclists getting two things for the price of one, it's invariably awful. 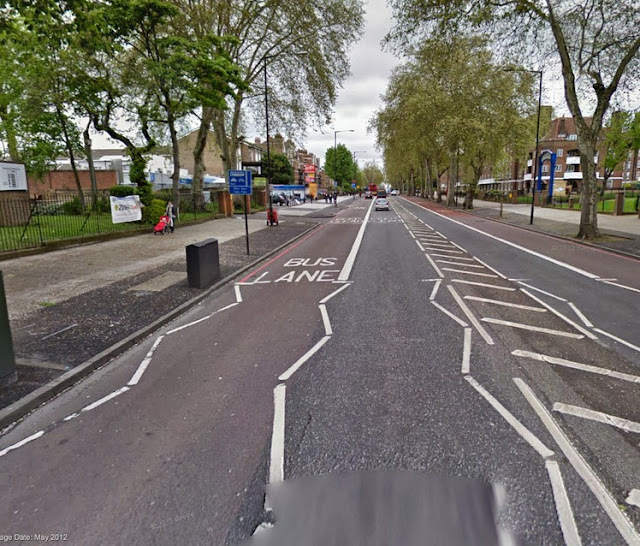 This is an example of the first type of parallelism, two "facilities" on one road.The pavement cycle track, with lack of continuity, terrible surface, and in the wrong place with respect to pedestrians, achieves nothing, but neither do the cycle markings on the carriageway, on a hostile space sandwiched between the pavement and a concrete wall, on which high volumes of motor vehicles travel at high speeds, and buses must occupy the same space. This is obviously an old set of facilities, but we get new examples of parallel provision being promoted all the time. A recent example is TfL's design for some junctions on Cycle Superhighway 2, as explained in their own video. As Easy As Riding A Bike covered this well, and I will not repeat what he said. My point here is that this is another example of trying to treat different sets of cyclists differently, and all losing out. Who are the advanced stop lines for? They must be for cyclists who want to eschew the pavement facility with the complicated, time-consuming method of making the turn, and do the turn in the road in the normal manner, with all the usual risks that entails. So why should they do that? Only because the alternative facility is no good. Dividing cyclists up into groups always means planning for failure of the facilities. Those cyclists who do not want to do a right-turn in vehicular manner, assumed to be "less confident", slower, or less well-trained, are assumed to be willing to waste a lot of time in an absurd manoeuvre. This is no way to get people cycling. So why won't the Superhighways, the fast, direct, convenient routes, suit them? It seems like we are heading for a repeat of the two-track mistake again. It sounds like the Superhighways will not be safe enough for all cyclists, that they won't be engineered close to international best practice at all, as stated two pages earlier. Consultants' reports on cycling in the UK use the language of different groups of cyclists all the time. They often couch it in terms of "Bikeability" levels, that is, level of training attainment. People who have attained high Bikeability levels are assumed to need less assistance in cycling on the roads in the normal manner, and fewer facilities. It follows then that if more people are trained to high Bikeability levels, councils need to invest less in infrastructure, and what infrastructure is provided will be less good. So training becomes a substitute for infrastructure. It should therefore come as no surprise that the leading proponents of the two-track approach in the cycling world are often those involved with cycle training. When, on Twitter, the other day, Mark Treasure asked David Dansky, "
What sort of cycle infrastructure would you like to see on the A10? Dansky's reply illustrates the hold the two-track approach has on the thinking of many in the cycling world. The "parallel quiet route" is the eternal fantasy of two-track provision. It doesn't exist. Quiet routes are quiet, by definition, because they don't go anywhere very useful very directly. They can never be a practical substitute for the main roads for most journeys. Dansky is assuming different categories of cyclist, probably linked to levels of training, which he works in. He's assuming that cyclists like him, highly trained, will be happy in those bus lanes on the A10. Those with less confidence and less training (which are assumed to be rather the same thing, so there's a commercial driver there for his business) can be consigned to the fantasy "parallel quiet route". It's a very beguiling idea for so many, and it maintains a certain status quo. Training is emphasised, expensive segregated provision need not be considered on main roads, the quiet routes "already exist" and so councils don't have to spend much, they just need to put up a few signs. Well, it doesn't work. The two-track approach has a history of failure. 99% of the journeys in the UK are not cycled, a level that has remained virtually static for decades, decades during which the two-track approach has been persistently promoted. My motion is intended to put down a policy marker, and make a statement to Transport for London and the boroughs about the standards we expect for the cycle provision to be delivered out of The Mayor’s Vision. There is a danger of repeating the two-track mistake again, of engineering another set of Cycle Superhighways that are fast and direct, but not safe enough to attract new cyclists, and which still exclude children and the less fit or less able, or just those, the vast majority, who don’t want to negotiate with fast motor traffic, and, at the same time, designing another set of so-called “quiet routes” that are tortuous, don’t go where people need to go, and are impractical. My motion compliments and goes with Rachel Aldred’s motion "When do we need protected space for cycling?". They both make it clear what standards we wish to see for the future cycling network for London. We need to genuinely “Go Dutch”, in terms of not just the provision of protected space, but in terms of the philosophy of cycling provision, making clear that it must be both uniform and fully-inclusive. We are used to inclusivity and uniformity in other areas of public provision. The health service has to be inclusive, the same, and equally suitable, for all. Likewise social services and education. Public transport should be inclusive (but often is not). We need to get into the same mentality for cycling provision. If every piece of it doesn't work for everybody who could benefit from it, it's being done wrongly. Great Post. Best of luck with your motion. Likewise - great post. Now how do we vote for it? Not all of us who are LCC members will make it to the AGM in person. So far as I can see it's not possible to vote on-line for the motions, but a proxy can be appointed. If you email agm@lcc.org.uk with your membership number you can get the Chair (or someone else) to vote on your behalf. I can't help thinking that the origin of this two-types-of-cyclist idea lies in the dislike of British cycle activists for continental-style 'segregated' cycle networks. They assume that people who want to be separated from motor traffic are incompetent, lacking in skill and want to dawdle. Councils have adopted this ideology with the results that David describes. This is a critical issue, and something that UK cycle provision has consistently got wrong since motor cars started causing problems. I think Paul is correct: this "several types of cyclist" thinking is indeed why we have ended up with crap facilities and the nation's cycling charity campaigning for a right to ride amongst motor traffic. The result is the worst of both worlds (cyclists as a disliked out-group, nowhere decent for ordinary people to ride bicycles) and a lot of money completely wasted. The health service is not the same in each area, some areas are better funded than others and some medications are paid for in some areas and not in others. Ever heard of the postcode lottery? Similarly with social services and education. Last week Birmingham council admitted it had serious failings and shortfalls in its child protrction provision. Education is the same, with league tables and vastly varying levels of attainment in different schools, with amazing levels of demand and performance at schools up and down the land. The egalitarian utopia you speak of does not exist and under the current government regime these gaps are getting wider. I've not had cycle training so have no official level of Bikability but am a keen cyclist. You are making snide digs and personal attacks on this Dansky chap, making sloppy assumptions and comments saying his views are based solely on protecting his personal gain which is totally uneccessary. You say his views represent an eternal fantasy, yet if seriously expect there to be a nationwide network of cycle routes that can be navigated without ever having to share roads with motor traffic, this strikes me as idea based more in the realms of fantasy. His approach seems more pragmatic. Don't get me wrong I'm not taking sides here, I think there are elements of truth in both sides arguments yet you seem to insist on one approach or the other and not a combination of both. I cannot see how cycle training can be viewed as bad, this dream network is not likely ever to happen, but is definately not going to happen overnight, so surely some cycle training better equips cyclists to deal with cycling as it is today, and will be in the near future. If the the LCC is so keen on attacking it it won't be getting any subscritions from me. You seem to miss my point about "uniformity of provision". Yes, we know there is a "postcode lottery" in the heath service, welfare, etc. Things are not perfect, for they never can be, but the objective is uniform provision for everybody. In multi-tier cycling provision, however, the objective is explicitly a different level of service for different people – a less good, less efficient routing, for example, for those who don't want to, or physically can't, mix with high-speed motor traffic. This, to me, is wrong. It's unfair. I don't decry all cycle training and I don't attack it in general, or trainers in general. Dansky's views may be sincerely held in a spirit of wanting more cycling, and believing that this is the way to get it. But I do think it is worth pointing out that many people currently professionally involved with cycling in the UK have, or arguably have, vested interests in keeping roughly the situation, and the system, that we have now. This goes not just for those involved with training, but for some consultants and some people working for cycling-related organisations. I make no money from anything connected with cycling, and have no vested interests. In fact, campaigning consumes a lot of my resources. Finally, the idea of "a nationwide network of cycle routes that can be navigated without ever having to share roads with motor traffic" is not an idea based in fantasy, it is based in study of places which actually have this, as my other posts recount. On the other hand, no place has achieved high levels of cycling through training alone, or even through training combined with UK-style two tier infrastructure, though training does always need to be a component, I agree. I'd go further still. The UK has a pretty much continuous, coherent network of thoroughfares for motor vehicles, and pedestrians . Sure, there is a postcode lottery on the provision of road and footway repairs across the country but each of these user groups can expect some degree of continuity. Not so cyclists. It's confusing. And if you say they can use the roads, this completely fails to acknowledge two important points. Firstly, people on bicycles are distinct form both pedestrians and motorists, as Bez has said, principally in terms of the range of momenta they encompass. You should not mix the three if their momenta are not going to be comparable (note that mopeds are very similar to bikes in this regard) . Secondly, while training is good and necessary, you simply can't get everyone perfectly trained (look at drivers), and unless you make it mandatory before the network is in place, and thus stop most people from cycling at source, many who cycle will never get trained. This is especially salient for kids - you show me a perfectly trained and behaved group of child cyclists, and I'll show you a flying pig. A third point is that a set of cars in transit most of the time are largely are one after another in strict series - a set of cyclists is a much more fluid entity. So mixing the two is mixing two intrinsically different styles of behaviour, which is bound to be problematic. You have to have a system which takes these factors into account, and you only have to look at most other countries of similar HDI to see how it can be done much better than in the UK. I don't really understand your motion as the quality of provision should, in an ideal world, reflect the type of road and potential danger. There is a risk that under budget constraints we will only get the lowest common denominator of provision where it is cheap and easy to install. The contention that main road routes are more direct and faster is not always true. The existing LCN route parallel to the A10 for all its faults is faster than the main road A10. There are far fewer traffic lights and the delay is generally shorter where they exist. It by passes the nasty, longer gyratory at Stoke Newington. The parallel route could be upgraded to a superb continental style route with far less investment than would be needed on the complex, variable width A10. When the extension to Cycle Superhigway 2 opens in a few weeks we will be able to test how well TfL are progressing. The ASLs are intriguing, they are not full width so offer not help to a right turning cyclist. I guess they are intended to mitigate the risk of left turn collisions where uk regulations don't allow the type of separate signalling you would see in Holland or the blending lane with priority for straight on traffic seen in Denmark. The ASLs will allow cyclists to get to the front of the lights and be more readily seen by other traffic, they will be able to pull away in a mixed group allowing some to make a 2 stage right turn by keeping to the left and moving into the cross road or follow TfLs strange circuitous route. The majority of cyclists have space to move away into the next section of cycle track with a slight advance over the motor traffic.